EMS needs immediately actionable information with immediate positive identification. Medications, medical conditions, allergies, medical implants are essential pieces of information that first responders need to know. Yet often the sick or injured cannot recall medications, forget to mention allergies and implants, and in some cases cannot speak. EMS-Alert puts this information into the hands of first responders. The electronic device the consumer carries shows first responders highly visible alerts of medications, allergies, implants and medical conditions for this person. The immediate availability of this information speeds care, increases safety and can even help save a life. Accidents, injuries and sudden illnesses are the world of the emergency care provider. The challenges associated with immediate assessment and care is urgent and often extreme. Responders live by the golden hour where minutes count. Providing care immediately and safely is critical. EMS-Alert provides information of immediate, actionable, value. Stress to a sick or injured person increases as they worry about who to contact and how to notify their doctor. Confusion sometimes makes it impossible for the patient to identify themselves, let alone who to call. 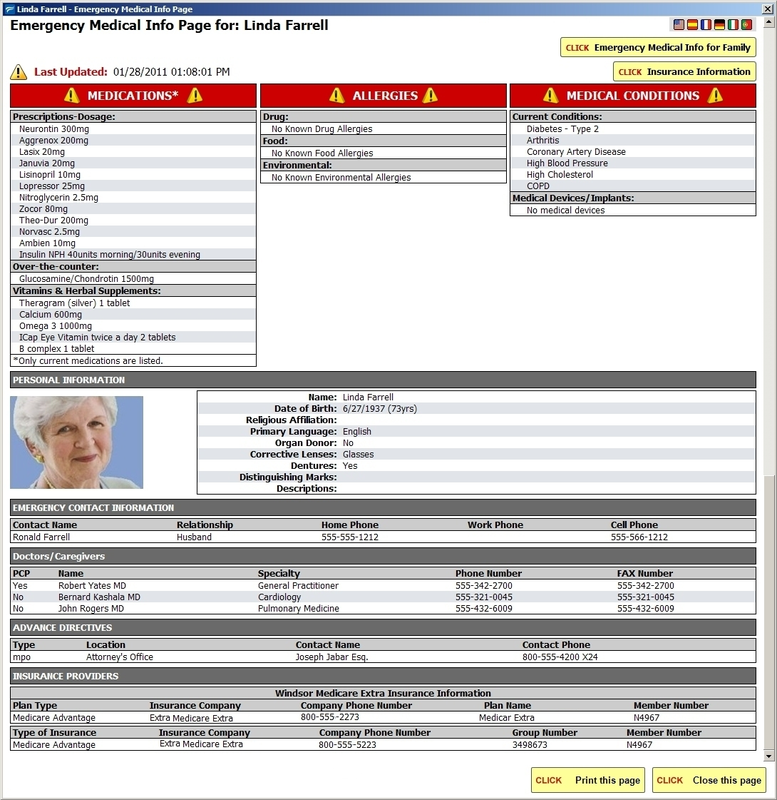 EMS-Alert provides contact information for both family members and physicians. It includes a photo of the owner assuring positive identification. It even includes reference to existing medical directives. EMS-Alert works with any PC. The device plugs into a standard USB port. EMS-Alert displays specific high-value information for emergency care. EMS-Alert is safe and easy to use! * Note-not actual size. Screen is cropped. * Sample Information is not intended to be medically correct.